Mediterranean cuisine is rich in tradition and is the ultimate in comfort, full-flavored, textured cooking, and The Slow Mediterranean Kitchen is a treasure for the many devotees of this popular cuisine. Bestselling cookbook author and writer Paula Wolfert is an authority on Mediterranean cooking, and the 150 recipes she shares in this book are authentic dishes from North Africa and the Eastern Mediterranean to Italy, Spain, and the South of France. The simplicity of the ingredients and combinations of flavors are greatly enhanced by the ‘slower’ method of preparing them. Although these dishes take a bit of planning, time and patience, the marinating and cooking itself does most of the work for you. Chickpea, Celery and Porcini Soup with Pecorino Cheese; Pot-Roasted Pork Loin with Fall Fruits; Seven-Hour Garlic Crowned Lamb and Fig, Fennel, and Lemon Tart are but a few standouts. Wolfert also provides her expert advice and welcome historical backgrounds throughout the book, and her recipe instructions are flawless. The slow cooking movement has been gaining momentum as an antidote to ‘fast’ foods. The Slow Mediterranean Kitchen will coach and inspire home cooks to take the time to nurture, prepare, and enjoy their meals. These are unhurried dishes that slow-roast, simmer, poach, stew and braise until the flavors meld together gloriously, relaxing to prepare and delicious to eat. 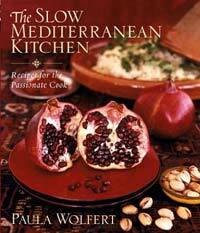 The Slow Mediterranean Kitchen is a rich resource for all food lovers—‘hurried’ or not.